Included in this update is a collection of Vertical Wall Beds, that can be customized in the Cut Ready software to fit your application. 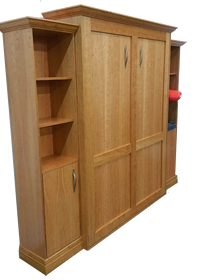 Also known as “Murphy Beds”, these are a collection of stylish, attractive bedroom furniture pieces for the home. They are ideal where space is limited, such as guest rooms, dorm rooms, etc. This collection provides you with a simple, yet elegant design that is easily assembled with a screwdriver using “Lock Joints”. 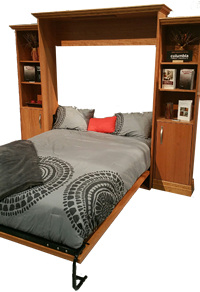 Vertical Wall Beds come in several styles and configurations, however, you may also create your own unique design. Side units may be adjusted to any width, depth, or height within a given range. Choices of undermount or side mount slides are also available. Get creative by applying different moldings to obtain your desired look. This simple, clean design will blend with virtually any decor. This update contains over 200 configurations for a Queen mattress. In the coming weeks, we will release two other sizes: Double/Full & Twin.